The frothiness in the financial markets continues to bubble up almost any direction you turn. This past week high yield bonds, which is another term for junk bonds due to their likelihood to default, crossed below the 5% mark. This is a new historic low and the prices paid for these bonds continues to relentlessly surge higher as investors everywhere search for yield. The coming massacre in the junk bond market is almost indescribable for those unfortunate investors who have no idea what kind of toxic debt their "safe" bond portfolios contain. The second location investors are finding yield is in American stocks through dividend payments. 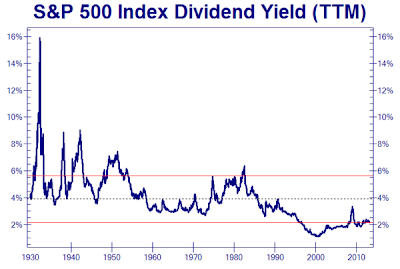 Analysts continue to say that dividend yields are extremely attractive relative to treasury bond yields, but if you remove the current bubble treasury yields from the graph and just look at historical dividend yields you have the chart below. Dividends traded in a 2% to 6% range for decades before diving lower and staying at or below the 2% range for almost 15 years running. Companies have found that investors are still willing to purchase stocks on the hope of the underlying stock appreciating, allowing companies to pocket what they formally paid out to investors in dividends to attract them to take on the risk of ownership. This will change in the future. On Wall Street we now see that not only have traders moved "All In" to the market, but they are borrowing at record levels to purchase even more stocks. 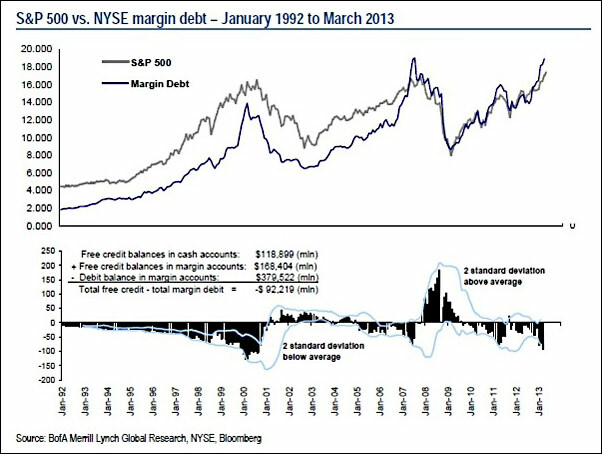 The chart below shows that the margin levels at the NYSE have now reached the 2007 peak where investors are 100% confident that nothing can go wrong which gives them not only the confidence to buy stocks, but the confidence to borrow to buy stocks. We know how this story ends, which can be seen during the last market bubble peaks in 2000 and 2008. As stocks turn, it creates a waterfall type decline because investors must meet margin calls during the liquidation. This is why stocks, and other markets with high leverage, rise very slowly over many years and then plunge rapidly during the panic liquidation. Corporate profits relative to GDP have a tendency to mean revert over time as the economy moves through the natural business cycle. Companies trimmed their largest expense, employees, since the depression began in late 2007, and they have been bringing back this expense at a very slow clip. This has allowed their corporate profits relative to GDP to surge to new record levels. Although it appears counter intuitive, the time to buy stocks is when profits are low because stocks measure market participants future expectations. Investors today believe that gravity no longer applies and that profits will continue their straight line up forever, the exact opposite of what they believed during the March 2009 lows when they extrapolated forward that corporate profits would fall forever. 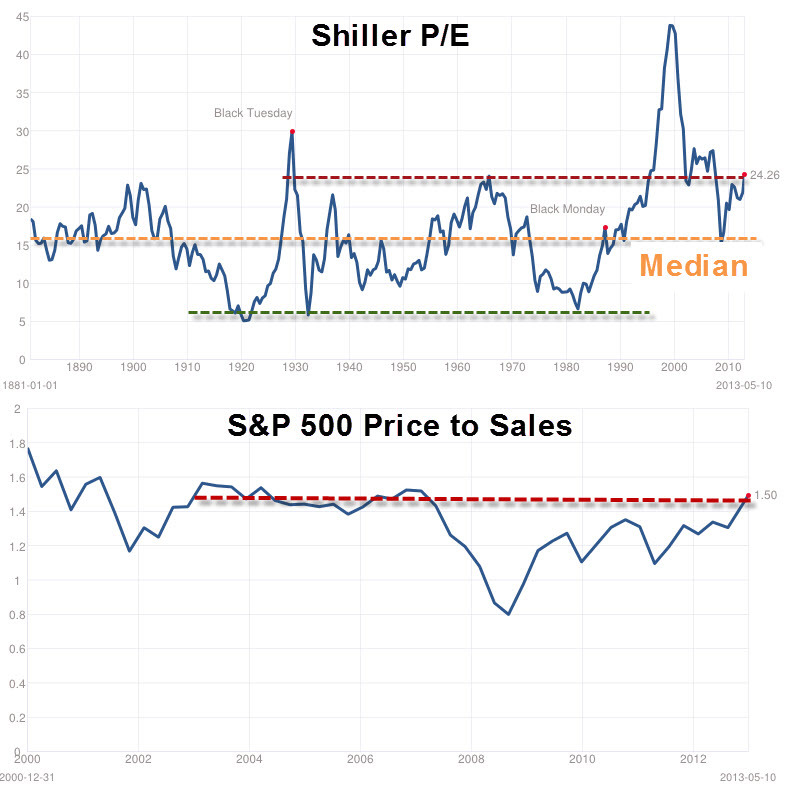 The Shiller Price to Earnings ratio, which measures the relative "cheapness" of stocks crossed above 24 last week. This puts it above the levels of previous secular peaks in the market. It can be argued that since stocks first entered the period of "Irrational Exuberance," as quoted by the then Federal Reserve Chairman Alan Greenspan in 1996, they have been overvalued. 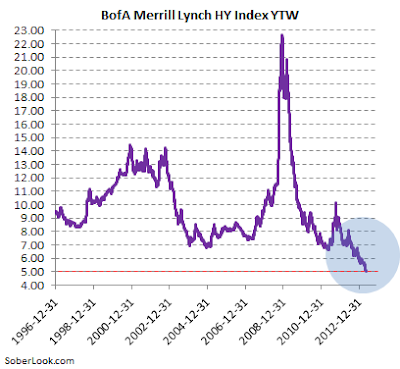 They only reached fair value during the March 2009 bottom. What does this mean? 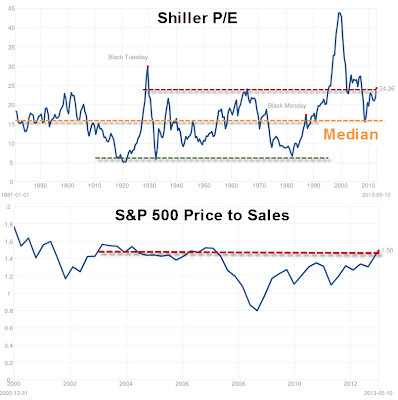 We have a long way to go before reaching a secular bottom in both sentiment and valuation. The ability for market participants to put this type of overvaluation on stocks based on what is actually occurring in the global economy is a true testament to the madness of crowds. 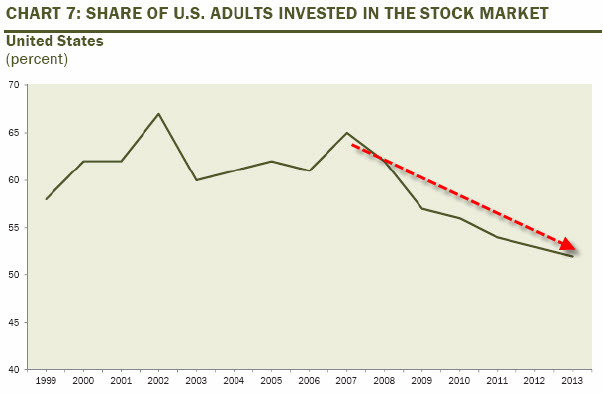 A benefit to the current stock market bubble is that it has created Ben Bernanke's desired "wealth effect," where consumers will feel wealthier based on the artificial reality that exists on their 401k statement every month and go out and spend. Or even better, go out and borrow to spend. 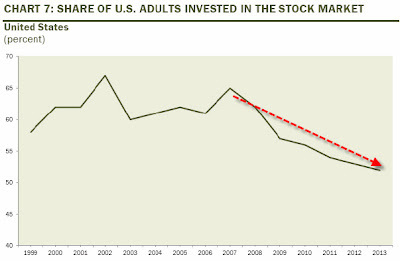 The problem with this, as noted by David Rosenberg this week in the following chart, is that only 52% of Americans are now involved with this market. This number is still well above the range from the early 1980's when stocks were widely considered toxic by the average American. We will get to that sentiment level again when we reach the real lows of this secular bear market. Based on historical data stocks are more overvalued and thus more dangerous to own today than almost any point in history. Does that mean that they will stop going up this morning? When markets get this type of built in momentum, which is then fueled by leverage, the level that prices can rise to can stagger the mind of rational market participants. On top of this artificial pricing you have the the fact that the market today is dominated by machines and algorithms that actively participate and then tend to "turn off" when things go bad creating flash crashes. It is possible that the next market clearing liquidation will occur over in a matter of minutes, not months as we have seen in the past. In the meantime we can continue to celebrate new highs every day as a testament to the strength of the economic recovery.